Happy Valentine’s Day (or “day before the candy goes on sale for half-price”), all. Like the similar holiday themed posts I’ve done, here’s one dedicated to the day dedicated to romance, affection, and other matters of the heart… and how it’s all presented in cartoons. There’s no one “definitive” Valentine’s Day special, but an entertaining one is “Be My Valentine, Charlie Brown,” the 1975 “Peanuts” special about how Valentine’s Day equals (in true “Peanuts” fashion) unrequited love for everyone in the cast. On DVD: This special’s on several DVD releases, including a stand-alone release (coupled with late 60s special “You’re In Love, Charlie Brown” and 70s special “It’s Your First Kiss, Charlie Brown”) and on the “Peanuts: 1970s Collection, Volume 2” DVD set. For the former, you’ll be getting two strong specials and one weak one (“It’s Your First Kiss”), while the latter includes “It’s Your First Kiss” and several other specials typical of the mid-to-late 70s run. 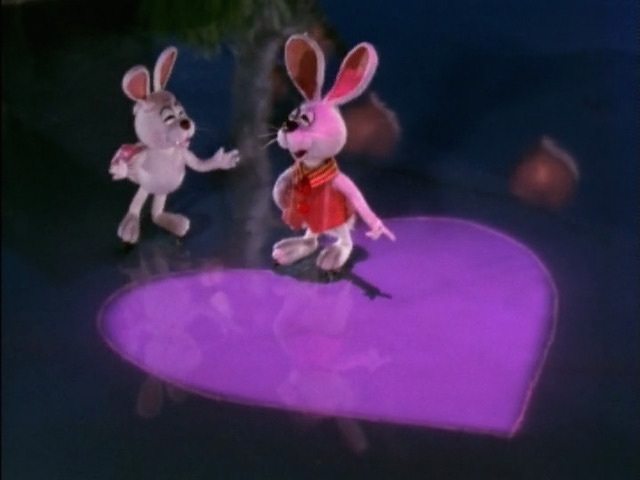 While an Easter special, this Rankin-Bass classic involves time-travel to other holidays, including a scene (and song number) set on Valentine’s Day. I appreciate that Rankin-Bass remembered that February 14 is very much cold weather (snow, etc.) in a good chunk of the country, versus most media (probably a result of Hollywood’s southern California influence) treating it like it’s a warm spring day. The fourth season episode “I Love Lisa” centers around Valentine’s Day, Simpsons-style, from KBBL radio’s DJs playing “Monster Mash” by mistake to Bart triggering a Valentine’s-themed Vietnam flashback for Principal Skinner (Bart: “cool, I broke his brain!”). For good measure, we also get President’s Day (and another playing of “Monster Mash” by KBBL’s DJs… “doggone it!”). And of course, probably the best episode featuring Ralph Wiggum, who has a crush on Lisa after she’s the only one in the class to give him a valentine out of pity. Google usually offers a special Doodle for Valentine’s Day. In 2012, we got a nice animated short set to the tune of an old Tony Bennett song. It also manages to be gay-friendly (in a montage at the end). Another set of Batman valentines, based on the 1960s TV series. A 1979 set of Marvel valentines. A 1980 set of DC Comics valentines. I like that they included a valentine of Aquaman with Mera and Storm (the giant seahorse) in the 1980 DC set, as well as what seems to be a Superboy valentine (a young Kal-El in flight).